The key to successful fly tying is repetition, so we are pleased to schedule a repeat of last month’s gathering of tiers at the Gilded Goat. They still serve beverages, so we expect another good turnout (25, last month). Evil Weevil Golden StoneBring your stuff and tie whatever pleases you, or just hang out with flyfishers. Beginners and observers are especially welcome. 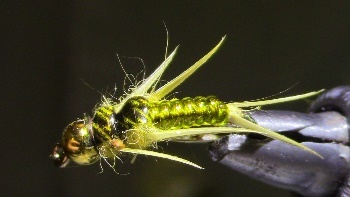 The Chapter will once again provide kits for a fly of the month, including all you need to tie a half dozen! Our April session features the Evil Weevil Golden Stonefly as shown in this YouTube video. If you are a beginner, or need to come straight from work, we will have loaner tools and equipment available. Contact Marty Staab to RSVP or with any questions. It helps if you let us know know if you intend to participate in the featured pattern, and especially if we can help provide tools and a vise. I hope to see a lot of you at the Gilded Goat right next to Trader Joe’s in Fort Collins April 3, 6:00pm - 8:00pm. 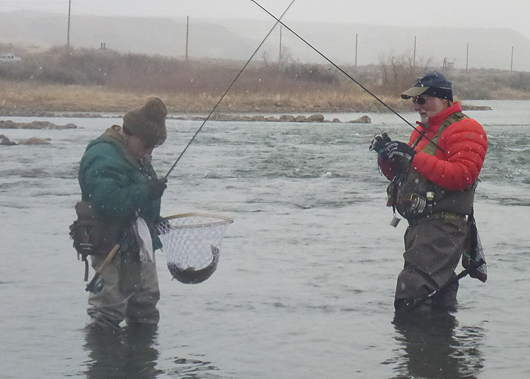 Help Rocky Mountain Flycasters (RMF) kickoff the 2019 field season by volunteering on this conservation project at Viestenz-Smith Mountain Park on the Big Thompson. RMF is supporting the City of Loveland and the Big Thompson Watershed Coalition with the planting of willow stakes at this recently rebuilt park on the Big T.
For revegetation projects volunteers are needed to help plant willow stakes and other container plants as needed. Clothing for all weather conditions (it’ll be early spring in CO so think layers: raincoat, long sleeves, jackets, & short sleeve shirts etc.) Good idea to wear pants instead of shorts. Sturdy hiking boots or shoes with good traction. Work gloves. Wading gear optional. All materials and tools to do the work & protective gear (gloves etc.,) will be provided to the volunteers. If there is time in the afternoon, volunteers will be able to fish in the park area—which hasn’t been open to fishing for some time. To sign up to volunteer using the Rocky Mountain Flycasters volunteer management system go to the RMF volunteer page. This will greatly facilitate sending on all the project details to you and providing you with updated project details as field conditions and plans can change. If you have not created a profile on the Rocky Mountain Flycasters volunteer management system, set up your profile by using this link. www.volgistics.com/ex/portal.dll/ap?ap=763710236. Once you have created a profile, log in to volunteer at: www.volgistics.com/ex2/vicnet.dll/?from=298024, and select the day of the April 6 revegetation project. You are welcome to email Phil Wright with your questions or to register your interest in participating. April 10: RMF Board Meeting at 7:00 PM. Members are welcome to attend any board meeting. Check with a Board Member for the meeting location and/or agenda. Join host Mark Miller on the lower Poudre and on the North Fork of the Poudre at the Fort Collins Gateway Natural Area. There are some wonderful skittish browns in this area. Contact Mark Miller to join in this Friday fishing day. The Big Thompson Watershed Coalition is planting of willow stakes at Cedar Cove on the Big Thompson River. Volunteer Positions have been filled. Capt Rob HagertyWhen talking leadership, organization, and running security for some of America’s biggest events, no one fits the part better than Captain Rob Hagerty. As CEO of Pyramid Fly Co., Rob is the perfect fit for the amazing team he has created. Capt. Rob has supervised and directed security and itinerary plans for the NFL and many Universities across America. With all of his event experience aside, Rob has over 30 years of fly shop and guiding experience. He was a deckhand, guide and Captain for many years and then went on to own his own big game fishing company, Team Ocean X-treme, located in Negril, Jamaica. Currently based in Fort Collins, Colorado, Capt. 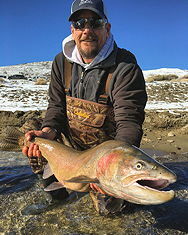 Rob is still running a plethora of sports and celebrity events, but he has been spending much of his spare time fly fishing his favorite waters and organizing upcoming fly fishing events within the industry. The Pyramid Fly Co. team is ecstatic to have such a genuine CEO and friend. Celebrate Earth Day with Odell’s 3rd Annual Poudre River Clean-Up and After Party. The clean up starts at 8am with the City of Fort Collins Natural Areas. Then join us at the brewery afterwards for a celebratory beer courtesy of Odell’s! Please reserve your spot on the cleanup party with the City of Fort Collins. On Sunday, April 22 from 8:30-11 am, volunteers from many conservation groups will gather at the brewery to form a clean up crew for a large stretch of the river as it winds through Fort Collins. The primary task will be bagging trash and debris. After the clean up we will gather back at the brewery for a free pint. 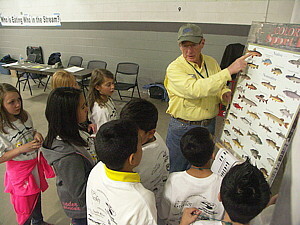 RMF will have displays on our various projects, kids’ fly tying and games as well as a raffle. Help out with our information booth, kids’ activities and raffle throughout the day. Stop by the brewery for a beer and support the effort. Please contact Dennis Cook as soon as possible to volunteer with RMF activities at this worthy event. Rocky Mountain Flycasters teams up with local school districts to present a cold water conservation game called “Who Eats Who at the Stream.” This interactive “game” introduces young students to cold water conservation concepts. It is great fun for students and presenters so find out more and sign up to take part. See Water Fests for more information and to take an active part in reaching these young people. Colorado TU is proud to announce that our Rendezvous will be returning to the historic Hotel Colorado in Glenwood Springs, CO for a three-day annual membership meeting and elections, special workshops. Join fellow TU members (new and old), outdoor professionals, guides, educators, and conservation groups for a weekend not to be missed. Read More. Don’t forget to book your lodging using our special conference discount at Hotel Colorado (only $119/night). Deadline for discounted lodging is in March 25, 2019. You can make your reservation now by calling 1-800-544-3998 and tell them you are with Colorado Trout Unlimited. As part of the Estes Park Annual Spring Clean-up Day Alpine Anglers will conduct a river clean-up along the Big Thompson River from the Olympus Dam in Estes Park downstream to the Fishing Access Ramp (mile marker 72). For those volunteers in the Estes Park area we will meet at the Estes Park Visitor Center (500 Big Thompson Ave.) before 9 AM. The town usually has coffee, hot chocolate, and donuts/pastry and they will supply garbage bags. For those coming up from the Loveland/Fort Collins area you can meet at the access ramp (MM 72) before 9 AM. What to Bring: It is recommended that each volunteer bring rain gear, work gloves and sturdy footwear since most of the shore of the river is boulders. For those coming up from Loveland/Fort Collins bring heavy duty garbage bags or if you do not have them we can arrange to get them to you before the event. Contact: If you plan on taking part please contact Chris Kennedy so that we can coordinate beforehand or if you have any questions.